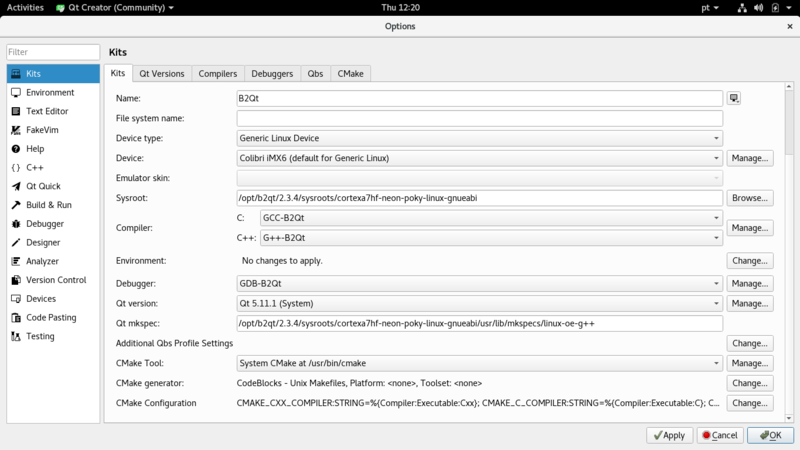 This article describes how to build and configure a Qt Creator development environment on Linux to cross compile Qt applications for OpenEmbedded based root file systems. 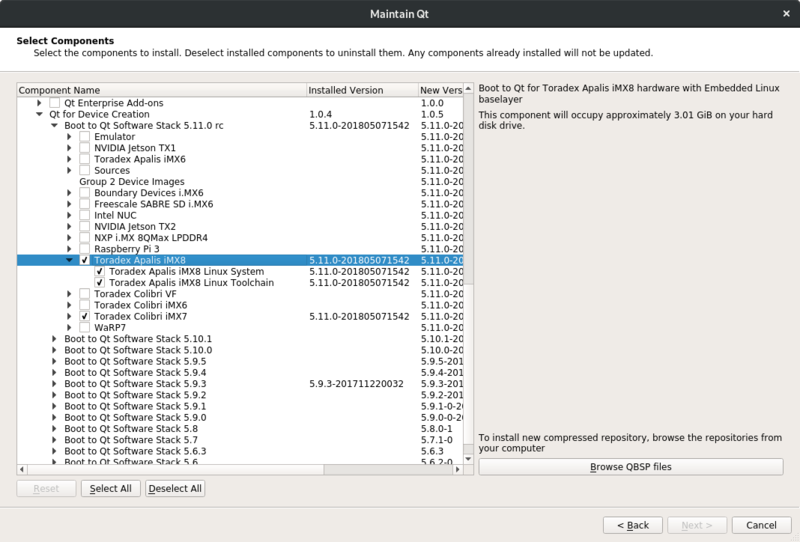 Qt Creator itself can be taken from your distributions repository, or its installer downloaded at Qt website under open source or commercial licenses. 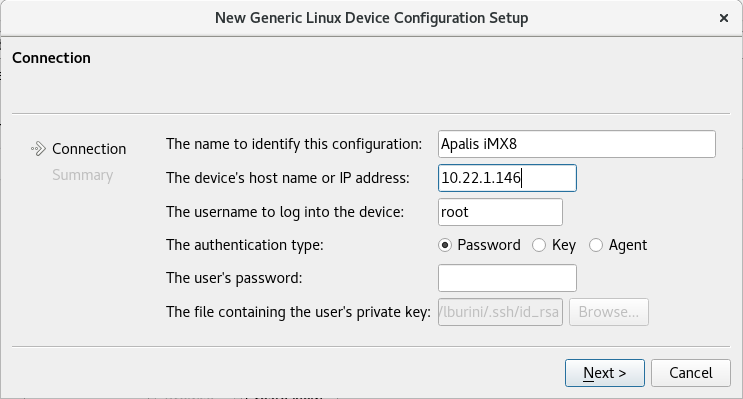 Note: Install the Qt for Device Creation Image for the target modules Apalis iMX6, Colibri iMX6 and Colibri iMX7 using the Toradex Easy Installer. Qt Creator provides a complete Integrated Development Environment for application developers to create applications for multiple targets such as embedded systems, mobile devices, desktop. One can install Qt Creator from its installer or from your distribution repository. To install Qt Creator from its installer, download it according to the chosen license. Note: It might be necessary to change the installer file mode to executable. 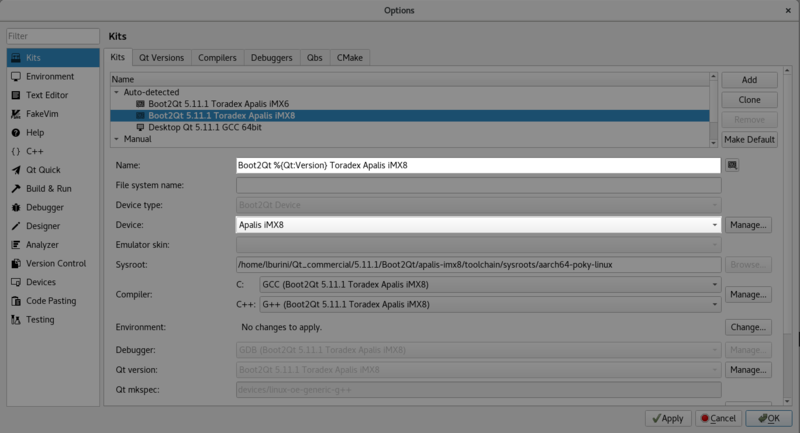 The commercial license enables Qt For Device Creation which provides a set of ready-to-use tools for developing in Qt Creator IDE for embedded systems such as Yocto based Boot to Qt pre-built images and cross compilation toolchains for a series of target devices (Apalis iMX8 and iMX6, Colibri iMX6 and iMX7). These components must be installed during Qt Creator installation. For further information about Qt for Device Creation, refer to Partner Demo Image - Qt for Device Creation. Current long-term release (Ubuntu 18.04) provide Qt Creator 4.5.2, which is sufficient recent for this how to. Visit Qt Creator Manual for further information about the IDE and its features according to the given license. Once Qt Creator is installed in the host machine, it is necessary to have a Qt enabled target device image as well as a built Software Development Kit (SDK). At last, this SDK must be configured in Qt Creator in order to build and deploy applications in your target module. Qt For Device Creation: a commercial offering that provides the Qt development framework for multiple embedded platforms. Build with OpenEmbedded Layers: build a customized image and toolchain based in OpenEmbedded layers and Toradex Linux BSP. 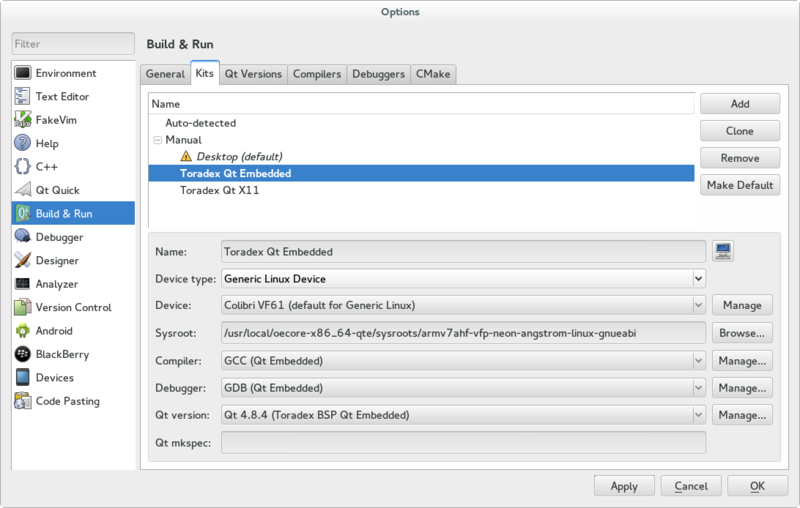 Boot to Qt for Embedded Linux: build a customized image and toolchain based in Qt layers and Toradex Linux BSP. 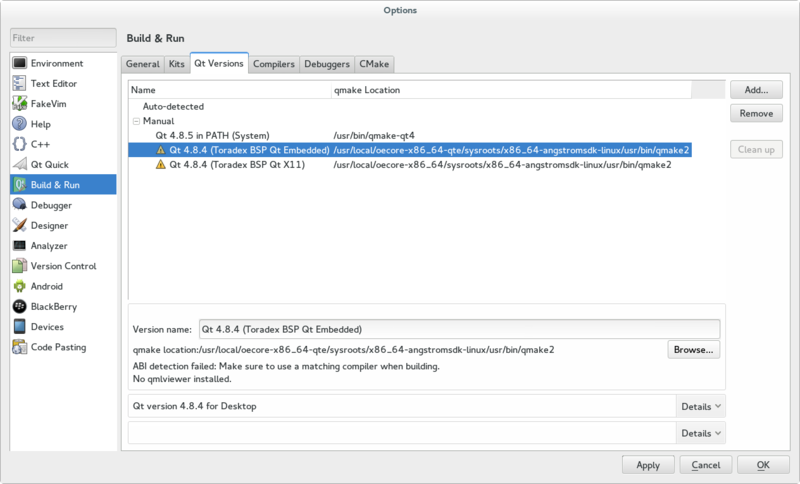 For Qt 5, one can install a Qt 5.11 enabled image directly from Toradex Easy Installer. On the target module you will need the Qt runtime environment installed. Therefore a new image with the Qt run-time libraries to allow executing Qt applications on the target is required. This step is mandatory! With the commercial license one can enable Qt For Device Creation which one of its key features is providing a pre-built Boot to Qt image. In case Toradex Easy Installer is not available for your module, get your image into an SD card in a couple of clicks going to the Qt Creator top bar option Tools → Flash Boot to Qt device. We need to have a full Qt toolchain, which provides beside cross GCC and GDB also the Qt headers to include and libraries to link against. With the commercial license one can enable Qt For Device Creation which automatically provides the toolchains for the installed components of the supported devices . Before starting Qt Creator, we have to export some build environment variables. 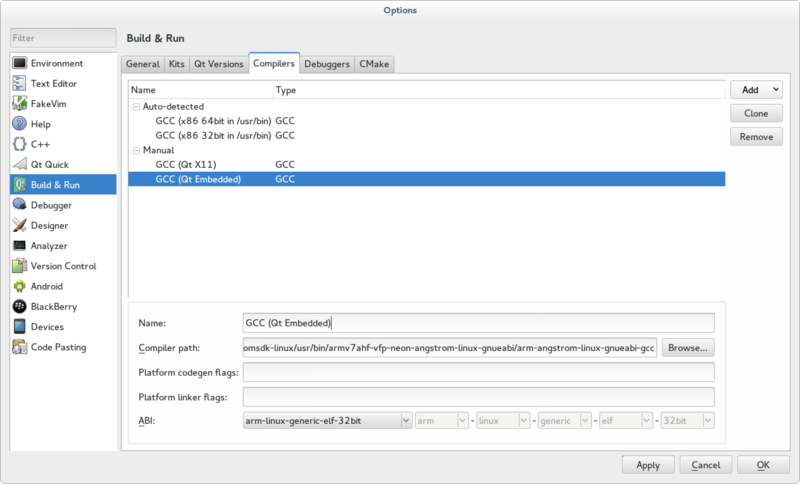 Qt uses special configuration files to describe the build environment called mkspecs (they specify which compiler, linker or other tools to use). However, this configuration files still need to know where the compiler (or cross-compiler in our case) is located. The SDK created a script which does all the hard work. Using the commercial license, the compilation kits for the supported modules are configured out-of-the-box, but it is necessary to configure a target Device. Go to Tools→Options and select Devices. 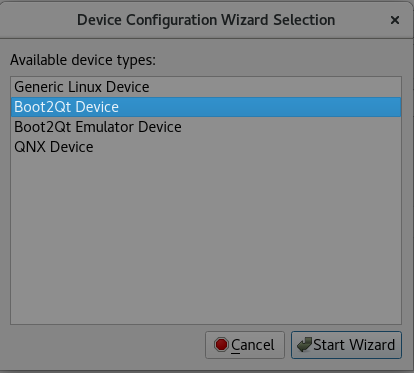 Add a target device and select the Boot2Qt Device. Add the configured device in the auto detected kit. For Qt 5, one can install a Qt 5.11 enabled image directly from Toradex Easy Installer. On the target module you will need the Qt runtime environment installed. 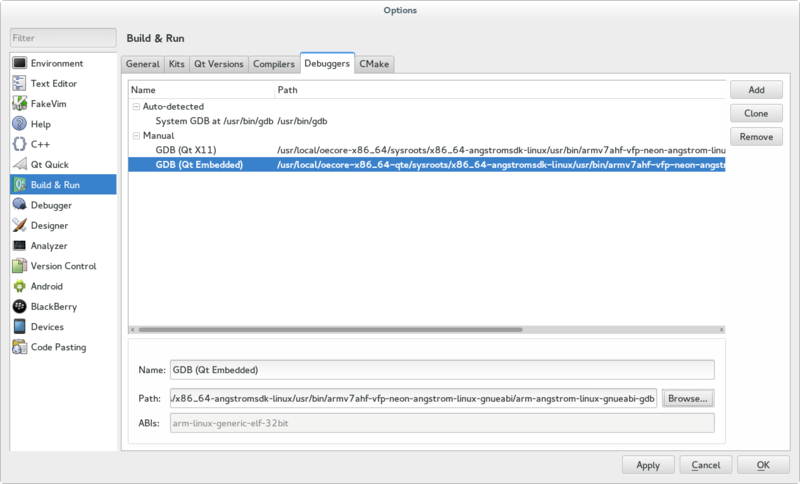 Therefore a new image with the Qt run-time libraries to allow executing Qt applications on the target is required. This step is mandatory! 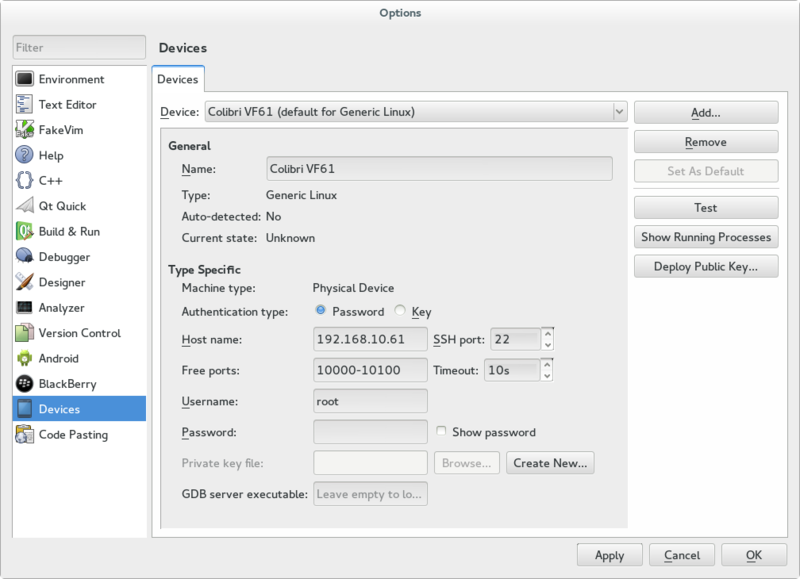 To build an image with Qt5, it is necessary to setup an environment on your host PC to build images with the Yocto Project based on Toradex BSP and the OpenEmbedded layers. Please refer to the OpenEmbedded (core) article to solve the dependencies associated to the environment and complete this setup according to your host operating system. Once the setup is done using Toradex BSP 2.7 or newer, one can verify Qt5 layer (meta-qt5) already included in the layers configuration file located at "oe-core/build/conf/bblayers.conf". To add Qt5 to oe-core, you have to add the "meta-qt5" layer. Starting with V2.6 meta-qt5 is part of the layers which get set up and the manual cloning and change to bblayers.conf is not longer needed. Add the layer to "/oe-core/build/conf/bblayers.conf". To build a Qt 5.9 enabled image using BSP V2.8, it is required to add a minimal set packages to your ~/oe-core/build/conf/local.conf. +IMAGE_INSTALL_append = "  qtbase qtdeclarative qtimageformats qtmultimedia qtquick1 qtquickcontrols2 qtquickcontrols "
+IMAGE_INSTALL_append = "  qtbase qtdeclarative qtimageformats qtmultimedia qtquick1 qtquickcontrols2 qtquickcontrols sqlite "
[oe-core] $ find ./layers/ -name "qt*serialport*.bb"
+IMAGE_INSTALL_append = "  qtbase qtdeclarative qtimageformats qtmultimedia qtquick1 qtquickcontrols2 qtquickcontrols qtserialport "
+IMAGE_INSTALL_append = " qt3d qt5-plugin-generic-vboxtouch qtbase qtcanvas3d qtcharts qtconnectivity qtdatavis3d qtdeclarative qtenginio qtgraphicaleffects qtimageformats qtlocation qtmultimedia qtquick1 qtquickcontrols2 qtquickcontrols qtscript qtsensors qtserialport qtsvg qtsystems qttools qttranslations qtvirtualkeyboard qtwebchannel qtwebkit-examples qtwebkit qtwebsockets qtxmlpatterns openssh-sftp-server gdb gdbserver "
For images starting with BSP V2.7 Qt 5.7, add the following packages Note: If you need fonts make sure fonts are installed and qtbase is compiled with PACKAGECONFIG fontconfig so they get found. +IMAGE_INSTALL_append = " qtbase qtbase-plugins cinematicexperience liberation-fonts"
+IMAGE_INSTALL_append = " qtbase qtbase-fonts qtbase-plugins cinematicexperience"
Attention: Every time one changes the DISTRO_FEATURES, one has to remove all build output and sstate cache, in our setup remove the directories build/out* build/sstate-cache or build/tmp* build/sstate-cache deploy, if present from any previous build. This can take several hours. When the build finishes, the image files will be located at "/oe-core/deploy/images/". Note: For more information concerning how to install your newly built image onto the target have a look at one of the following articles. In order to compile the required libraries, a full OpenEmbedded build environment need to be in place at first (see the Build and Deploy the Target Image). The toolchain will be located at "/oe-core/deploy/sdk". Warning: It is required to source the script to export the environment variables every time in the same terminal session you run Qt Creator. Now, start Qt Creator in the shell where you sourced the script. 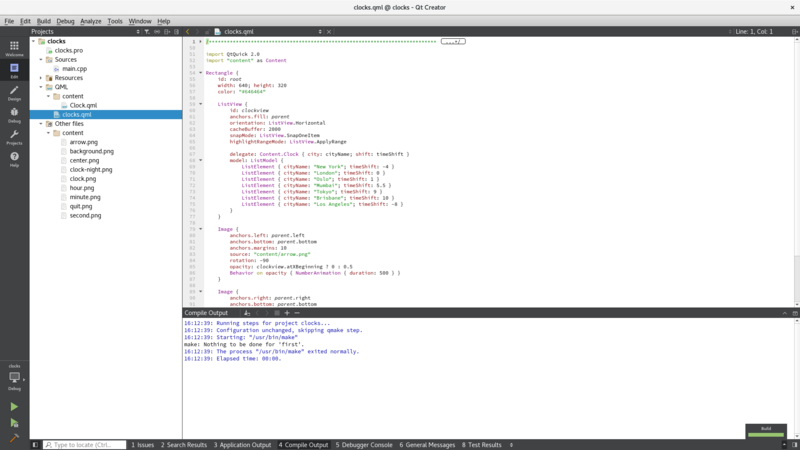 Note: It is recommended to source the script that exports the environment variables in qtcreator.sh script. Now one can create a new project using the new Kit. 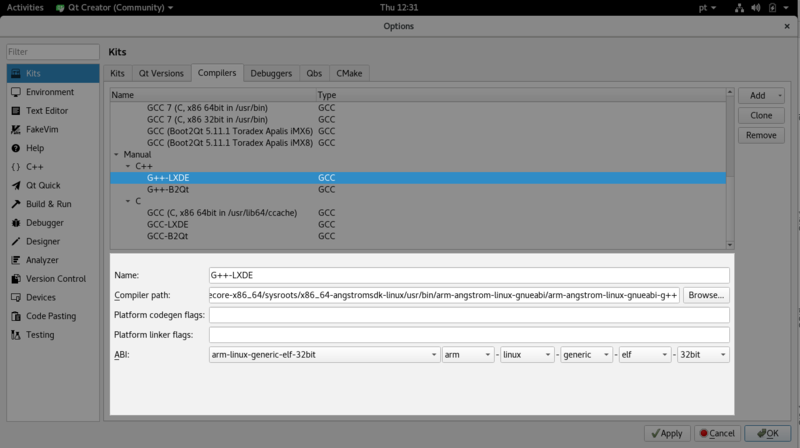 Qt Creator automatically configures build configurations for the cross compiling Kit. If you have an existing project, you can configure Build & Run Configurations under the Project tab on the left side. 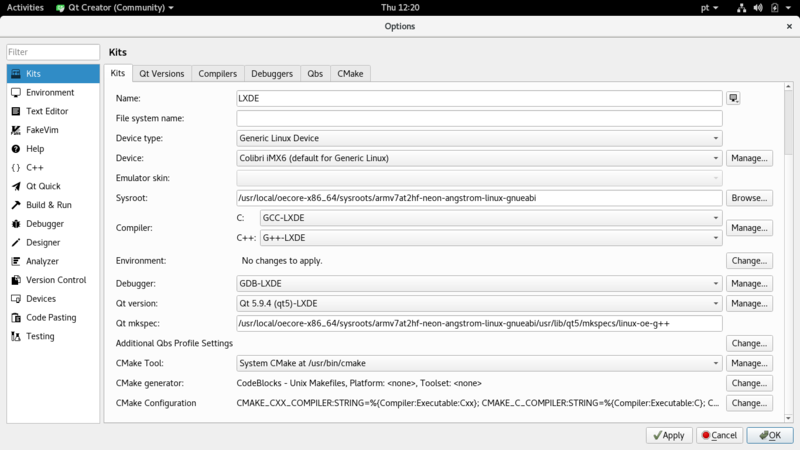 Go to Add Kit, we can now use the newly created Kit LXDE. Warning: Boot to Qt for Embedded Linux is not maintained nor supported by Toradex. You can post your question in the Qt Forum or contact The Qt Company support if using a commercial license. To build an image with Qt5, it is necessary to setup an environment on your host PC to build images with the Yocto Project based on Toradex BSP and Boot to Qt for embedded Linux. Please refer to Build Your Own Embedded Linux Image article to solve the dependencies associated to the environment and complete this setup according to your host operating system. After solving the dependencies indicated, it is necessary to download the repositories on your host machine to build Boot to Qt for embedded Linux. This how to uses Apalis iMX8 as the target device. This can take several hours. When the build finishes, the image files will be located at "/b2qt/meta-boot2qt/build-apalis-imx8/tmp/deploy/images/apalis-imx8". Note: For more information concerning how to install your newly built image onto the target, refer to Toradex Easy Installer. If your module is not supported by Toradex Easy Installer, have a look at one of the following articles. In order to compile the required libraries, a full OpenEmbedded build environment need to be in place at first (see the Build and Deploy the Target Image for Qt). 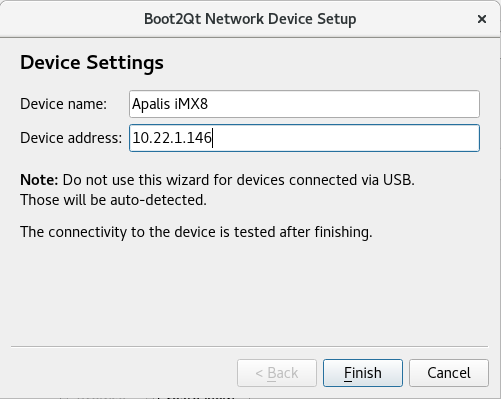 The toolchain will be located at "/b2qt/meta-boot2qt/build-apalis-imx8/tmp/deploy/sdk". If you have an existing project, you can configure Build & Run Configurations under the Project tab on the left side. Go to Add Kit, we can now use the newly created Kit B2Qt. To build a Qt 4.8 enabled image, it is necessary to setup an environment on your host PC to build images with Yocto Project based on the OpenEmbedded layers and Toradex BSP. Please refer to the OpenEmbedded (core) article to solve the dependencies associated to the environment and complete this setup according to your host operating system. 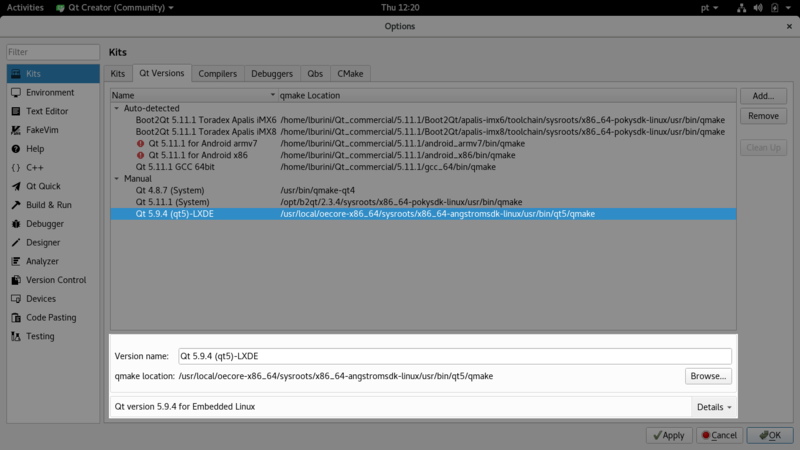 The Qt 4.8 Embedded is still useful for devices without any graphical acceleration or with drivers providing this also to users relying on the frame buffer device. With the modules based on T20/T30 the drivers for hardware accelerated 3D and video decoding are only available for an X11 system, so you probably want to use Qt on X11. 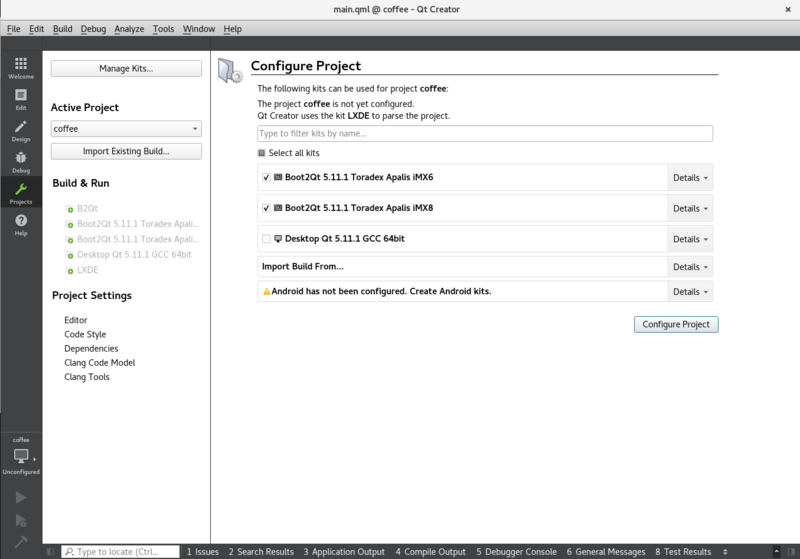 If you have an existing project, you can configure Build & Run Configurations under the Project tab on the left side. Go to Add Kit, we can now use the newly created Kit Toradex Qt Embedded. Note: When using Qt Embedded, you may want to switch to the "Run" configuration and add the argument "-qws" to the binary as standalone (instead using the Qt for Embedded Linux server).